Status: Contest finished on 25-04-2010. After the success of his previous remix contest, Funkerman has decided to start a new producers contest in collaboration with Shermanology. 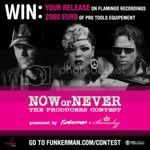 You could win a release on Flamingo Recordings and 2000 euro worth of Pro Tools equipment! Enter now! Me and my team were so excited to see so many people producing and talking about music during the Automatic Remix Contest. There is some much talent amongst you, and we want to see more! Flamingo Recordings is known for their quality vocal tracks. So we asked Shermanology, responsible for the vocals on ‘3 Minutes to Explain’ and ‘Automatic’, to provide you with exclusive vocals to help you get started on your track.